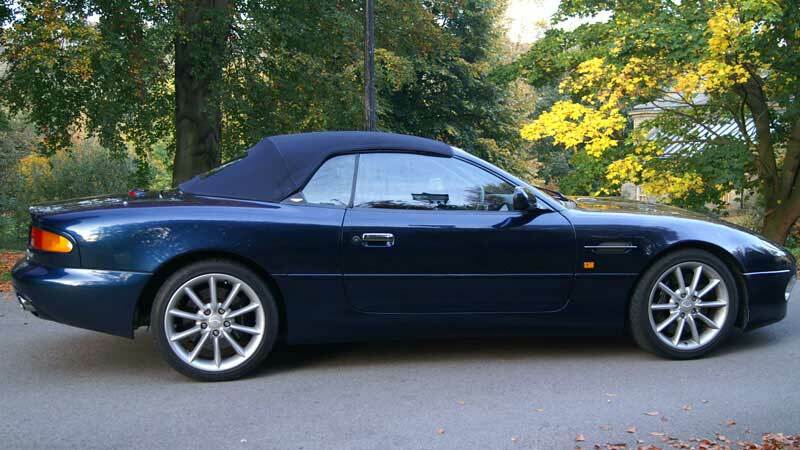 Why Hire an Aston Martin DB7 Vantage Convertible? For a first class supercar experience treat yourself or a loved one to an Aston Martin Vantage hire in Yorkshire. Widely regarded as a piece of automotive art, the open topped Aston Martin DB7 Vantage Volante is one of the most handsome supercars ever produced. The music from the Vantage’s fire breathing 6 litre V12 engine, together with its elegant looks and beautifully crafted interior mean it’s guaranteed to attract attention wherever you go. 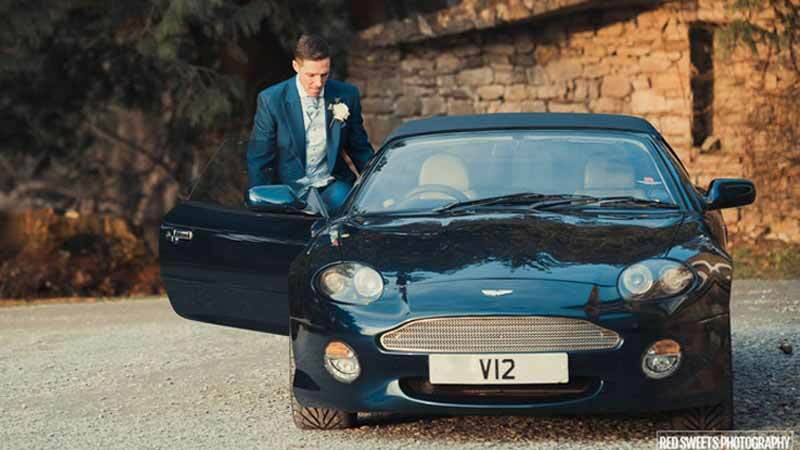 Hire this archetypal Bond car for a surprise gift or self-drive Aston Martin wedding car. Our Aston Martin Vantage is the Volante model (Aston-speak for convertible), finished in a lovely shade of dark blue. The matching dark blue mohair hood is electrically operated and has a heated glass rear screen. The 10 spoke 18” aluminium alloy wheels are unique to Aston Martin. The interior, fashioned in grey hand sewn Connolly leather with blue piping and burr walnut trim is as pleasing to the eye as the sweeping lines of the exterior. Equipment levels are also lavish with a CD stacking system, heated seats and powered everything. There are two front seats and two rear seats. The rear seats have limited legroom and are really only suitable for children. The DB7 Vantage is powered by a 6.0-litre V12 that was developed by Cosworth. 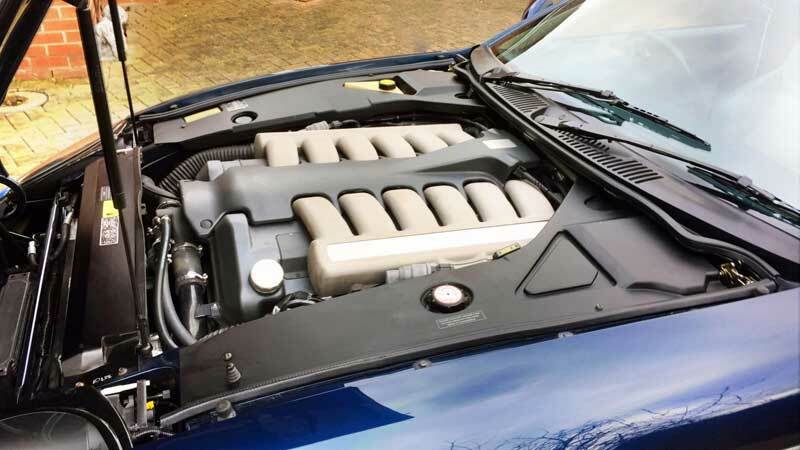 It produces peak power of 420 bhp and 400 lb.ft of creamy torque. It’s a glorious-sounding engine, and a wonderful popping and rumbling sound emanates from the none-too-subtle tailpipes. Manufactured between 1999 and 2003, the DB7 Vantage had real worldwide appeal and set new standards of power, refinement and reliability for handmade luxury sports cars. 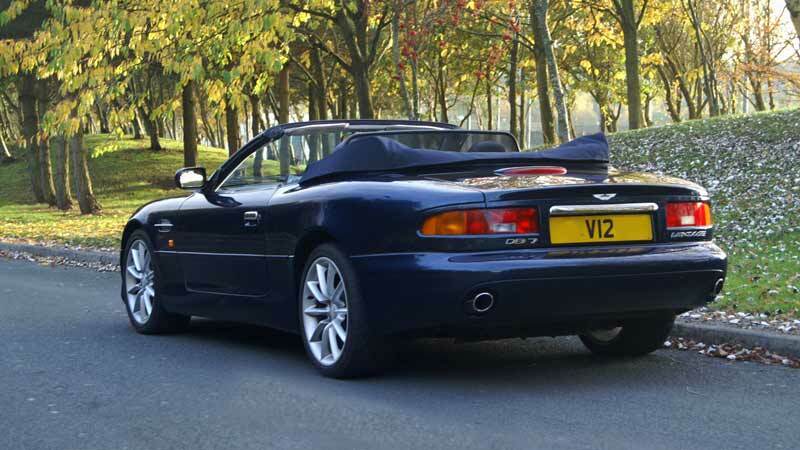 In 2000, the year our Aston Martin convertible hire car was produced, Vantage Volantes cost over £100,000, the price of an average semi-detached house at the time. Take a break from today’s world of clinical electronic control and experience the character of a supreme driving machine with an Aston Martin convertible hire in Yorkshire. And, as an Aston Martin wedding car it will do you proud. 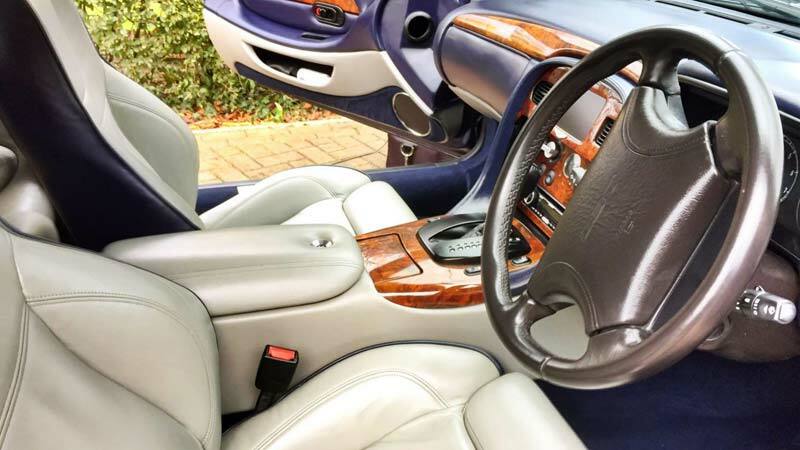 We also offer a silver Aston Martin DB7 coupe. CD stacking system and radio. Built in Sat Nav and Socket for your own Sat Nav. Our Aston Martin hire car is available for collection in Leeds, West Yorkshire. Our location is within easy reach of all the major towns and cities in the north of England. We are in an ideal location for Aston Martin Hire Huddersfield, Wakefield, and Harrogate. For Aston Martin hire Hull and York, you don’t have too far to travel either. Rotherham, Doncaster and Sheffield Aston Martin hire is within an hour’s drive of our Leeds base. As are most of the towns in South Yorkshire and North Yorkshire via the M1 or A1(M). Once you’ve collected it you can drive our Aston Martin hire car anywhere in the UK subject to our terms and conditions. The predecessor of the Aston Martin DB7 was the Aston Martin Vantage. In 1994 the first straight six supercharged DB7 came off the production line, and by 1999 the V12 engined DB7 Vantage had superceded it. 4100 of the Vantage models were produced, around half of which were drop tops.